Though the recent elections show a downfall in BJP’s winning streak, Narendra Modi is still the forerunner for 2019 elections. Modi may have to take a long and unsteady road instead of the easy cakewalk to ensure this success. The 2019 Lok Sabha elections are approaching and it seems that the country is gearing itself for the big battle. Last time, when the 16th Lok Sabha elections were held in 2014, NDA, led by Narendra Modi, swooped the elections by winning 336 seats in which BJP won 282 seats and the remaining seats were won by their allies. BJP is losing its shine but Modi continues to sparkle as people’s favourite in the 2019 elections. This is mainly because there is no strong opposition to Modi. As per an opinion poll conducted in last November, Congress is getting ready for this battle with a steady increase in the popularity of it’s President Rahul Gandhi. 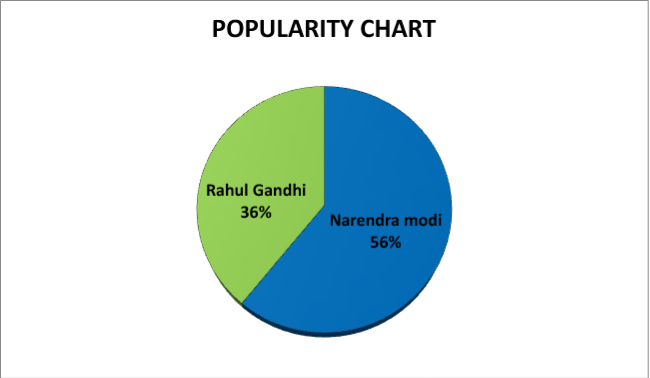 Modi’s popularity is wanning but Rahul is still way behind Modi in the popularity chart. What will happen if Elections take place today? Who will win the 17th Lok Sabha election? Will it be the NaMo led NDA or the UPA? The recent opinion poll called “Desh ka mood” conducted by ABP news explains the current mood of the nation. With more than 15,000 respondents, the results claim to favour Modi returning to power. According to the survey, the BJP will win 300 of the 543 seats, if elections are to be held today. The Congress-led UPA may bag 116 seats and the other parties may win 127 seats. It also claims that Indian National Congress, who slumped to its worst electoral performance in the 2014 elections, will be defeated once again by the BJP. Is Modi Wave Still there? 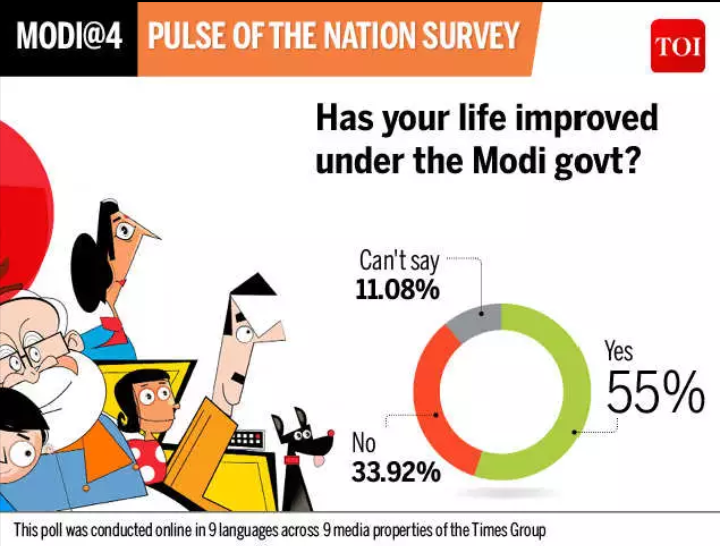 An online survey conducted by” Dailyhunt” and Nielsen India, a data analytics company, was based on an opinion of over 54 lakh respondents from both within the country and abroad. 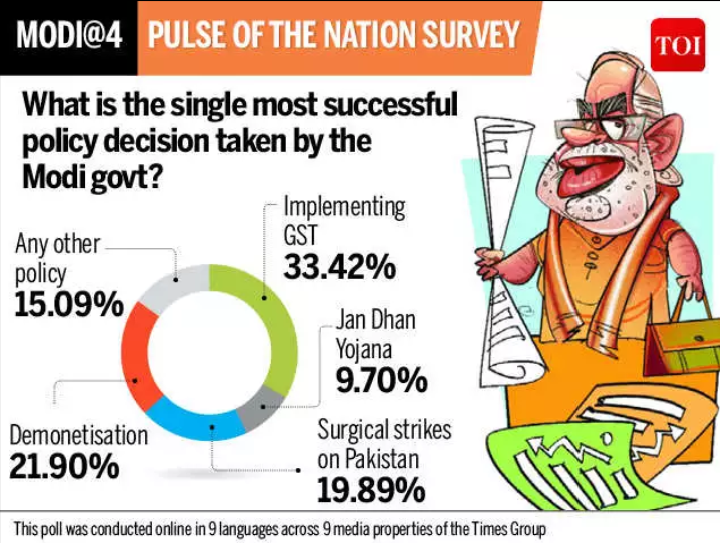 According to the survey, “More than 63% respondents expressed more or similar trust on Narendra Modi as compared to 2014”, which shows that the people are satisfied under his rule. The survey also stated that more than 50% of people believe that the second term of Modi “will provide them a better future”. It also claims that 60% of them trust Modi the most to uproot the longstanding issue of corruption. Why MODI is the ideal choice for 2019 elections? During the last elections, Narendra Modi became the Prime Minister amidst a lot of excitement and celebration that the nation has not seen in decades. With power comes responsibility, the whole nation had a lot of expectations. Modi’s normal background, his success and Congress being the ruling party for years made him a natural choice for the people who wanted a change. The people expected to experience three things: less corruption, greater decisiveness in policymaking and more market-friendly reform. One has to admit that he did make real progress on all the three. Many of his decisions have turned out to get positive responses. It is also known as “Modicare”. It is the world’s largest health insurance scheme. This will provide $6,700 in annual insurance coverage for up to 500 million lower-income Indians. Ujjawala Yojana is a social welfare scheme launched by the government with a promise to provide free LPG connection to 5 crore BPL (Below Poverty Line) households in India. (PMA “Housing for all” by 2022 is it’s objective. It helps the lower middle class and the people from below poverty line. They are provided home loan interest subsidy on purchase/ construction/ extension/ improvement of their house. It has sanctioned loans for about 65lakh houses till now. 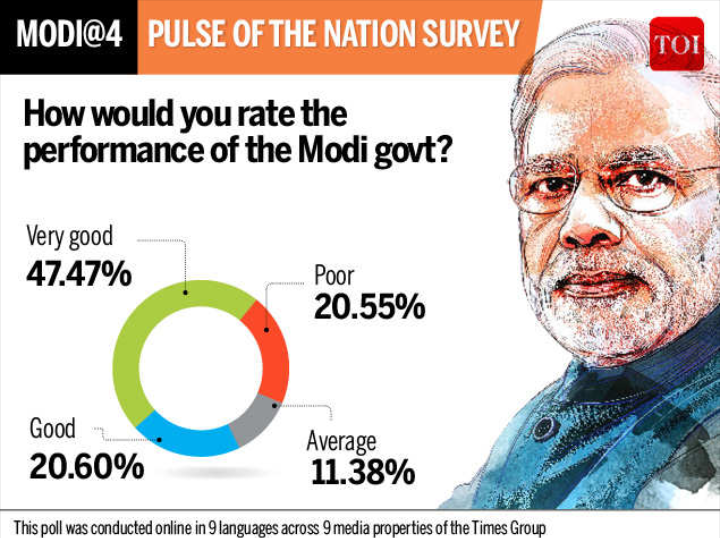 Most of the people feel Modi is one of the best Prime Ministers the world has ever seen. There may be many flaws in his decisions but one cannot deny that there are as many positives as well. A second term of NDA may bring more glory to the nation. How will demonetization affect the 2019 elections? How will GST affect the 2019 Elections? Goods and Service Tax (GST) was launched by the government. GST is a single taxation system that will reduce the number of indirect taxes. From now on, a single tax will cover up all the other taxes. So, what are the benefits of this bill? Definitely, the prices of products will reduce and the common men, who are fed up with high prices, will be benefited the most. Also, it would reduce the burden on the state and the central government. Also, GST will build a corruption-free taxation system. But along with these benefits, it will have some cons too. The introduction of GST will impact the real estate market. This would increase home buying products by 8% and reduce buyers’ market by 12%. But overall, this seems to be another positive move by Narendra Modi, which will help him in the 2019 elections. What makes Modi ahead of other candidates? His decision-making ability is one of the key reasons that make him the favourite. His brave decisions and quick implementations which are not quite often seen in politicians is his trademark quality. He has huge crowd support which is largely due to the fact that he came from a common background. He is believed to know what are the problems that a common man will face and is expected to bring light into their life. He uses technology to the optimum level starting from radio to social media which helps him connect with all generation people. The nation has seen a good economic leader, not from any economic background leading the country to greater heights. The connection that he has with the mass is something that the people had always wanted but many failed to do what Modi is doing. The GDP is estimated to be 7.1% in 2018 which shows a steady growth of 2.5% from 2013. The inflation rate was brought down by 6.56% in 2018 when compared to 2013. Thus under Modi government, the economy grew as expected. Is Narendra Modi favourite among the youth? The game changers are the youth as more than 65% (800 million) people are under the age of 35. First-time voters count to 10%. This has lead to the candidates giving more importance to social media campaigning. Dr. APJ Abdul Kalam once said that youngsters are the future pillars of India and every election proves it to be true. The whole Nation is eager to know the decision of the youth as it is not only going to decide the fate of India’s next five years but also help/ destroy a million lives. So the question is whom does the youth’s support? 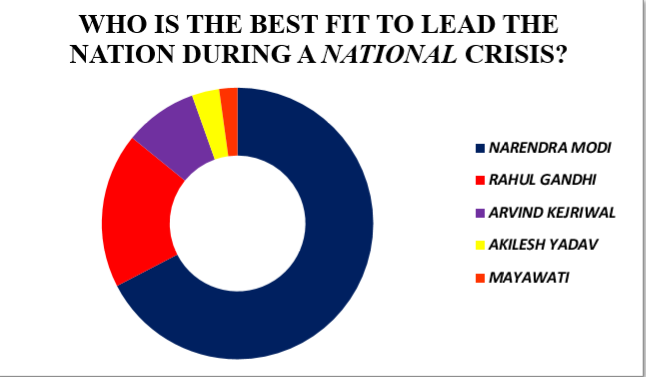 “Almost 6 out of 10 youngsters trust Narendra Modi to run the country better.”, suggests a recent poll. 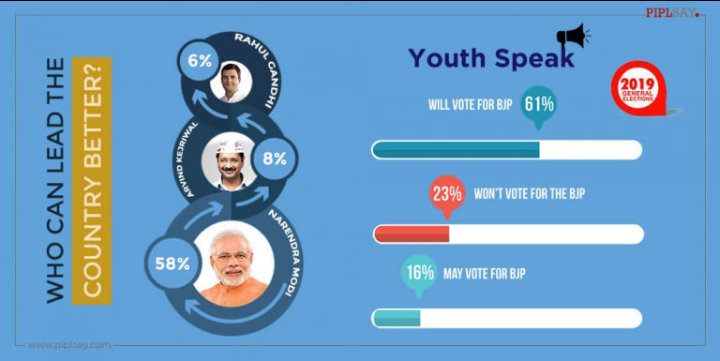 Though 42% of the youngsters opted other leaders over Modi, Modi wave continues to prevail among many youngsters who wish to see a brighter future. What are the chances of BJP in 2019 elections? Though BJP lost the recent elections, it was only BJP’s loss and not the victory of Congress. BJP is taking measures to win the elections; other parties are working to stop them from winning it. The oppositions are trying to defeat him unitedly. So, as far as the 17th Lok Sabha Elections of 2019 are concerned, Indian National Congress’s road to the elections is looking a bit hazy and is in need of fresh ideas. Namo led BJP though moving up and down, looks as strong favorites. Who do you think will win the Lok Sabha Elections 2019, let us know in the comments section! PREVIOUS Previous post: How Congress and their Sympathizers Tried to Defame Modi and Modi-Government Since 2014?